Wes Anderson, hipster cult film director extraordinaire, is the product of what used to be called a broken home as his parents divorced when he was a young boy, but just like one of the most successful directors of all time, Steven Spielberg, he used this experience to channel into his films. Every one of his works, which those averse to his toils claim to be more or less the same thing over and over, features a father figure the other characters have, shall we say, mixed feelings about, and that was true of his first feature Bottle Rocket, where James Caan fulfilled that role. In Rushmore, it was Bill Murray, one of Anderson's most sympathetic father figures, while in his third effort, The Royal Tenenbaums, Gene Hackman took the part. That was perhaps ironic as Hackman's titular Royal in the 2001 piece was Anderson's most antagonistic dad character, while behind the scenes the star proved to be one of the director's most antagonistic performers, possibly because Hackman saw too much of himself in the role for comfort and became more argumentative about the path the persona was taking as the shoot drew on. He always was one to apply himself to the method approach. But for all that behind the scenes trouble, it proved to be his last great performance as his career wound down with only three more movies to go; though he could have still been working well into the twenty-first century, he preferred to concentrate on his well-earned retirement. And also, in an apt development, his new career in penning violent Western novels, which is just the sort of activity you could imagine Royal doing had he applied himself, since almost everyone else in the film was an author in some capacity: in typical Anderson style, we see the covers of these tomes and they are deadpan ridiculous, while also making a comment on the characters (Owen Wilson's "American James Joyce" Old Custer became an internet meme). But Royal is a troublemaker trying to get into his family's good books for reasons he barely understands himself, pretending to be terminally ill to ingratiate his manipulative manner to a brood which has been damaged by the presence of a flawed father who utterly failed to guide them properly. Bill Murray had been part of the supporting cast of The Royal Tenenbaums, playing a substitute father figure for Royal's adopted daughter Gwyneth Paltrow (who hasn't satisfied her in that capacity either), but on the set he had been very helpful to the director in sticking up for him in the face of Hackman's recalcitrance, and as a reward secured the lead in Anderson's next project. This would be his biggest budget production to date, and every dollar of that was on the screen, including an entire cutaway ship big enough for his cast to inhabit. But why would he need such a thing? It was down to this being The Life Aquatic with Steve Zissou, a film for which the world was not yet ready, judging by the lambasting it received from critics and public alike. The titular Zissou was played by Murray and based on the real-life sea explorer Jacques Cousteau. While he didn't try the French accent, Murray was most believable as one of Anderson's wayward father figures, someone who his followers admire, but is actually not as much of a leader as he likes to believe as he guides his crew around the oceans of the planet in search of fish to capture with his camera. But when we first meet him, there has been a tragedy: his closest buddy has been eaten by what Steve terms a "jaguar shark", an unknown species that devoured the man before his horrified eyes and left him with an overwhelming rage for revenge. Though he has posited himself as a friend to all fish, this one in particular has earned his wrath. Presumably Anderson and his co-writer Noah Baumbach (no stranger to daddy issues in his self-directed movies either) had seen some of Cousteau's earlier footage, most likely the great documentarian’s Oscar-winner The Silent World, where in spite of his reputation as an admirable environmentalist he and the crew of The Calypso were filmed attacking and even killing various creatures while claiming to be doing good works in the name of preserving the seven seas and their denizens. Thus Zissou's mania for slaughtering the magnificent beast that chewed up his colleague was a channelling of Cousteau's less than decent behaviour in his earlier days, which might also be why, while the film was dedicated to Cousteau, his family were supposedly unimpressed. All of which handily fed into Anderson's portrayal of his antihero as the kind of man younger men would like to look up to yet display so many flaws that they become difficult to ignore. At its heart this was essentially one of those comedies where the men are idiots while the women look on, powerless to intervene and make them realise the mistakes they are making as they have to learn that themselves. Owen Wilson was the pilot who believed Steve had fathered him many years ago, and we saw through him the dangers of hero-worshipping an older man who seems to have the wisdom of years, but in fact is just as daft as anyone half his age. Assembling one of the director's best casts, the look of the work went some way to compensating for its overstuffed nature. The father was missing, deceased in 2007's The Darjeeling Limited, but was centre stage for Anderson's first animated feature, the 2009 Roald Dahl adaptation The Fantastic Mr Fox, which suggesting he was mellowing to the common thread in his works, since that title character was assuredly the hero throughout. Later, both parents were absent in the life of the central orphan in 2012's Moonrise Kingdom, and surrogates had to be found (not that this director was too interested in mothers); interestingly, Zissou mentions in passing he hates fathers and never wanted to be one, despite enthusiastically embracing his latest addition to his team as a long-lost son. But it took 2014's The Grand Budapest Hotel to truly get to grips with the surrogacy concept. Ralph Fiennes was that surrogate father, the lightly mysterious of purpose M. Gustave, who is the concierge at the hotel in question and takes the new lobby boy (Tony Revolori) under his wing, as this teen too is an orphan, thanks to war. There is war brewing in the narrative, it being 1938 and the site of the establishment being in Central Europe, for what we were watching was in flashback twice over, from author Tom Wilkinson's reminiscences, to his younger self Jude Law expounding on his memories of the Grand Budapest, then to the now grown lobby boy (F. Murray Abraham) who took over the running of the place some years before, and is seeing it run into the ground by lack of interest by staff and guests alike. But it was the central relationship between Gustave and his new charge that provided the engine driving the piece; we are not told if he had any children, probably not as his focus is on seducing the elderly countesses and nobility that flocked to the hotel in its heyday, but he definitely becomes a guiding force in the latest staff member's education of how to get by in the world, especially since it was a different war he lost his entire family and village in. This affectionate centre of an otherwise somewhat arch, even standoffish movie, struck a chord in audiences and earned Anderson his biggest success: not everyone encouraged to check it out "got" it, but he won himself many new fans who subsequently investigated his filmography to see if they could enjoy it as much. If they visited The Life Aquatic with Steve Zissou, they would find the Wes Anderson style as its most distilled, and even now, knowing what we do about his leanings and preferences, it is something of a challenge, yet with The Grand Budapest Hotel it shared many obsessions, notably his love of language and especially names. Everyone's name in both films were designed to roll off the tongue with some relish, to the extent that you had the impression the director was casting such a vivid array of character performers simply to match to them the most distinctive monikers possible. Only the coarse language in the latter betrayed a misstep he didn't usually make, as he tried out the sort of swearing Martin Scorsese would be proud of, which jarred with the ever-meticulous attention to detail, of a vintage variety in that case. But as 2018's animation Isle of Dogs proved, Anderson's preoccupation with examining the worth and reasoning of father figures was never going to leave his oeuvre. 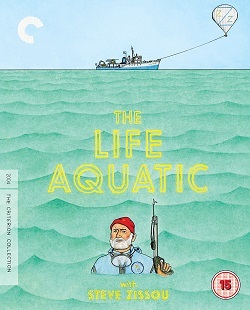 [Criterion have released The Life Aquatic with Steve Zissou in a Blu-ray edition: a new, restored digital transfer, approved by director Wes Anderson, with DTS-HD Master Audio soundtrack.